Virtual Cockpit HUD heads-up display using OSD, is any transparent display that presents data without requiring users to look away from their usual viewpoints. Displays a set of instruments to assist in flight. This panel shows your battery voltage. To read correct values you have to set it in MP. MinimOSD-Extra can be set to warn you if voltage gets below the value you set in CT or OSD menu. Ground level indicator. If you descent lower then home (like in a valley) the "-" sign would go above horizon line. This panel indicates the charge level of your battery. It shows your charge level in percent. You should set your battery capacity in Mission Planner. To be able to use this panel you need a current sensor in addition to APM. Center is probably the simplest panel we have. It is a kind of crosshair that usually placed in the middle of the screen. In newer versions, an artificial horizon replaces the center. A landing aid was added (see Landing Aid). This panel indicates the current draw of your system, in the present moment. To be able to use this panel you need a current sensor connected to APM. This panel indicates your airspeed, which is the speed relative to the air around your plane (fixed wing). It is measured using a pitot tube and a differential pressure sensor. Requirement: To be able to use this panel you need the pitot tube and the differential pressure sensor connected to APM. If not it defaults to the ground speed. This panel displays the ground speed as calculated by the GPS, similar to the speed provided by an automobile GPS. Efficiency panel is a 3 in 1 panel. It shows your planes actual efficiency. It indicates how many mah is needed to fly one km or mile. It shows an up arrow indicating that you are probably in a thermic. This panel shows a symbol that has two states. If warnings are enabled, and there is no GPS fix than a warning message is shown. This panel shows the exact GPS coordinates. It is useful when you want to know where you were at particular moment. This panel is a rough Compass. This panel is an exact Compass showing values in degree. This panel indicates if there is communication between APM and MinimOSD. If it blinks, communication is normal. If it does not blink, than MinimOSD has lost communication with APM and therefore is not receiving data. This panel indicates the amount of throttle you set by your transmitter, or throttle APM sets in auto modes in percent. This panel indicates the current selected flight mode in APM. In MinimOSD Extra, a skull represents System ARMED warning. This panel is a artificial horizon. It indicates the horizon, gets shorter when you do a vertical dive. This panel indicates direction to home, relative to your plane. You need a magnetometer to make this panel work precise. This panel indicates your plane distance from home in meters if you set metric system for units of measurement, and feet if imperial. This panel indicates your height above your home position in meters if you set metric system for units of measurement, and feet if imperial. Some people prefer imperial as it is more refine by feet versus one meter when you are landing. mAh is based on voltage, used current and time-lapse between readings. Efficiency panel uses the battery percentage reported by APM. Knowing the time-lapse between first battery % reading and current battery % reading, we can infer how many time will take to battery % goes to 0%. For example, if you consumed 10% battery in 1 minute then you will have 9 more minutes of flight. As copters do not have stall speed. warning is "vertical speed warning" shown as "High VSpeed!". It is set in the CT Tool as 10th of vertical speed units. So, if you want to set it to trigger the warning above 100 m/min you should set 10 in the textbox. In terms of feet, say 18 units (about 3 feet per second). Take in account that it can have a considerable lag since we "smooth" the readings because APM reported vertical speed is very jumpy. This panel indicates your height above sea level in meters if you set metric system for units of measurement, and feet if imperial. This panel shows the pitch of your plane in degree. This panel shows your planes roll in degree. If your plane leans to the right is positive value, to the left is negative. RSSI panel indicates your radio signal strength (Received signal strength indication). It shows it in percent. You need a receiver capable of sending analog RSSI information. The "Real Heading" is the difference between "nose heading" and the "course over ground" heading. So, if your quad is pointing east and it is moving south-east, it will show 45° with the arrow pointing up-right. A summary of your flight details is shown at the end of each flight. Rotating 10 seconds in summary and 10 seconds of the last panel display. Flight data is reset when throttle next reaches 15%. For planes, if you have airspeed sensor, it will refer to your airspeed. If you are not using airspeed sensor, it will refer to your ground speed. For example if you set it at 5 km/h Stall Speed, if your speed is less than 4 km/h, it will not show up as a warning. If you have set metric, than it will be in Km/h. If you have set imperial, than it will be in mph. Time panel shows the time since MinimOSD-Extra booted up. Normally this is also your system boot time also (when only one onboard battery is used or all electronics are turned on together. ), but you can reset MinimOSD-Extra by pressing reset button on it. Than this panel will start counting again from zero. The latest release the clock starts as soon as you have a stable reported altitude and throttle moves above 15%. This way you can power everything, wait for GPS satellite acquisition and when you want to takeoff you don't need to press reset, just takeoff and it will start counting. Some of us use video frequency that needs a license. This is HAM license. When yo have this license you also have a call sign that you should transmit with your video. This panel is responsible for that. Waypoint direction panel indicates the direction to the next waypoint, relative to your plane. You need a magnetometer to make this panel work more precisely. It still works well with only GPS, but when there is strong wind, than it can show a bit different waypoint direction (usually it is a good approximation). Waypoint distance panel indicates your plane distance from the next waypoint, in meters if you set metric system for units of measurement, and feet if imperial. This panel uses the barometer. It indicates how fast your plane gains or looses height in m/s if you set metric system for units of measurement, and ft/s if imperial. This panel indicates your ground speed. This is your speed relative to ground determined by GPS. It shows horizontal wind direction and speed (on the top), and Vertical wind speed (on the buttom). Warning panel is an advanced safety function of MinimOSD-Extra. Warning messages are blinking signs to let you know there is something wrong, or dangerous is happening. It should also automatically return to Panel 1, your main panel when a warning is detected. Recent versions did not return to panel 1. To help you more, in an emergency situation warnings will bring you back to your home screen automatically, so you can focus on flying. You can configure warning levels for Stall in CT and OSD menu, Overspeed in CT and OSD menu, Battery Volt in CT and OSD menu, RSSI in CT, and Battery Percent in CT.
Minim OSD - What is in the Extra? 1. You need to use a Mavlink 1.0 compatible firmware on APM. Change accordingly and save the parameters to APM. Arducopter 3.1 earlier versions used SR3. You also need to have the data stream rates configured correctly. To do so, connect to Mission Planner. Go to configuration. 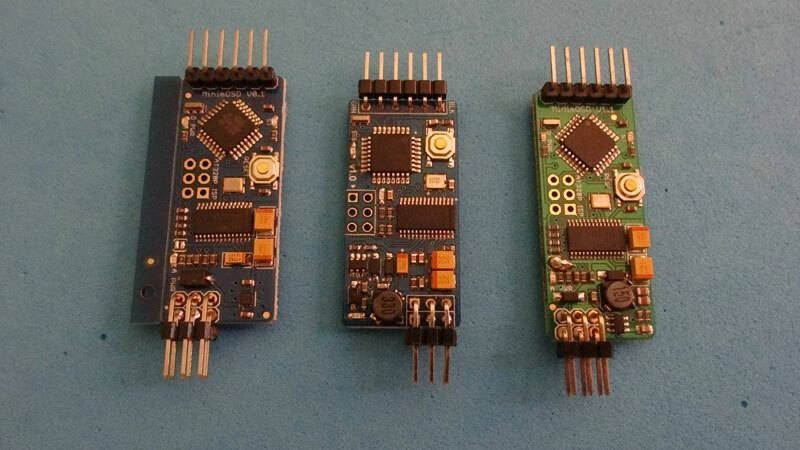 Arducopter firmware you need SR0 parameters set. 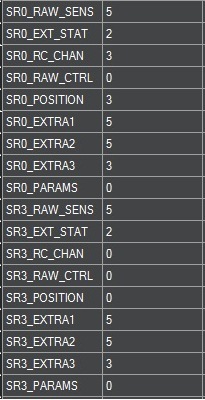 SR0_PARAMS = 50 (default). For planes, just SR3. You make these changes in Advance Parameter List.